Soil provides important living space for humans, vegetation and wildlife, as illustrated in our recent blogs on Land Cover mapping with PROBA-V, with increasing competition between the different land uses. Soils also play key roles in water management (e.g. soil sealing), in our climate (carbon sequestration), health (e.g. contamination) and in cultural services. This year’s theme of the United Nations’ World Soil Day draws attention to the pressing issues affecting soils, and in particular the positive contributions that pulse crops make to soils by helping to fix nitrogen and boost soil fertility. A true symbiosis, that links well within UN-FAO’s International Year of the Pulses. 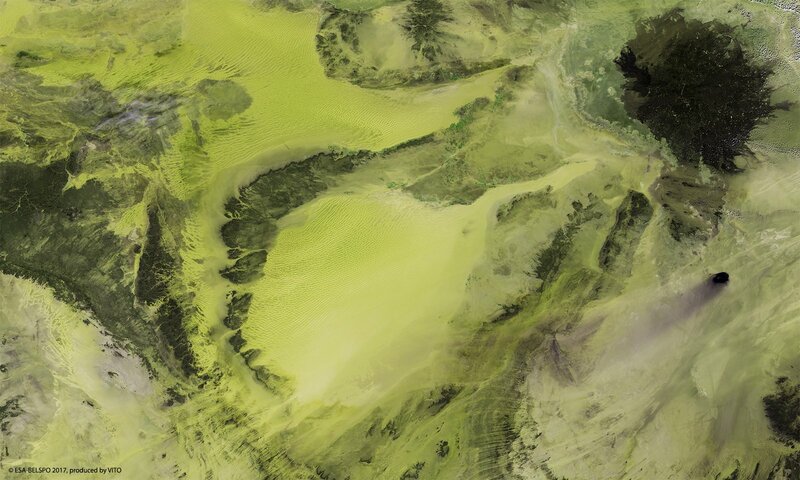 This weeks PROBA-V image, shows us the inhospitable Sahara desert in the Fezzan region in southwest Libya, where a sprinkling of remote oases enabled ancient towns and villages to thrive. More recently, the northern and southern borders of the Sahara are the scene of significant development efforts and partnerships to combat desertification and contribute to a land-degradation free world.